Here’s your must have Spring lip product, Clinique Chubby Moisturizing Lip Colour Balm. A super nourishing balm that’s loaded up with mango and shea butters plus a hint of color! Dry, tried lips can always use an extra boost that’s why lip balm is a solid choice but so inconvenient to tote around in its traditional pot form. Clinique Chubby Moisturizing Lip Colour Balm come housed in a chubby little pencil that travels easily and hydrates lips while giving them a blush of color. For those who go the more minimalist route with their makeup or their lip makeup in general these should appeal as the formula is incredibly lightweight, hydrating, and leaves color behind that enhances your lips natural pigment without being overly done or garish. I tried five shades and all five give my lips just the right amount of gorgeous color without being too bold, too over done, or too heavy. Part of the main appeal of the product is the way it visibly enhanced the color of my lips. It really gives the MLBB (my lips but better) experience a new meaning! Compared to other products of its kind I felt like this was what set it apart and made it so enjoyable to use. The texture feels like a lip balm of sorts with a bit of a waxy feel however not an unpleasant one simply one that wraps lips in a moisturizing finish. They don’t give a ton of shine but they do leave behind a nice healthy sheen. If you’re wanting to get the most bang for your buck you can easily swipe ’em across your cheeks for a flush of color as well! Shades I tried were Mega Melon (deep melon peach shade), Super Strawberry (rich fuchsia berry), Whoopin’ Watermelon (sheer pink), Fuller Fig (brown fig), and Graped-Up (sheer plum). Out of all the shades I loved Super Strawberry, Mega Melon, and Fuller Fig the best however it really doesn’t matter which shade you try as most all are guaranteed to work no matter your skin tone in my opinion. Formula wears quite long and with a clear gloss on top they really pop and sizzle! These swivel up and do not have a sharpener so if you prefer a precise point at all times you might be a bit disappointed when the point starts to get a bit stubby. Anyone who likes minimal makeup or those who apply and reapply balms and glosses throughout the day (these are great for traveling with and for touch ups throughout the day). Anyone who wants to multitask one product for cheeks and lips (nothing stopping you from using ’em on your cheeks for a bit of color). Anyone who likes an MLBB (my lips but better) experience (these enhance the natural pigment of your lips). Those who want a bold, pigmented lip product (these are subtle). I absolutely adored these not only for the formula but also for the considerably cheaper price tag ($15). The formula just does something wonderful for my lips and leaves behind a lovely little burst of hydrating color. I’ve tried plenty of products like it but none are nearly as nice plus as I said can’t beat this price. Great stuff. You NEED these. I know some of you are loving these so do share your thoughts and which shades you got! I hear they are selling out fast at counters so perhaps haul ’em online! OMG I *do* need it! lol kimmy ;-D def! I’m going to macys right after work to grab the other shades girl! Want…Need…HAVE TO HAVE! ….but will wait till a gwp somewhere! lol kelly ;-D believe nordies has it in feb eh? ;-D! I was wondering whether the colors would be noticeable on more pigmented lips? jane you’ll be fine! they’ll simply add to your pigmented lips and give them more color while making them look fuller ;-D or at least this was the case for me. sweeettt cj ;-D but update me? I wanna hear your thoughts after you try my dear! thank yaaaaaaaaaa! and that isn’t even intense, I sheered it out a bit ;-D it applies way better ;D! can’t wait to hear! 😀 Happy weekend gorgeous! ha katros possibly girl ;-D you’re going to like the Mega Melon. My swatches really don’t show the gleam or the color well here sadly (I’m not so fab at swatches as you can see) but the color is way more vibrant in person! It’s a fab shade ;-D! and one of my favs! Update me when it arrives? Curious how you likey! I do like this, I got it in the mail today. It is very much like a lip balm in texture but the color payoff is between balm and medium coverage lipstick. 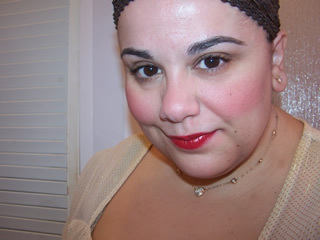 Not quite either, too opaque for balm—to sheer for medium coverage lipstick. Cute packaging idea. I’ll probably buy a couple more this summer in the other colors. glad to hear you’re loving it katros ;D! Hey girl are you getting DMs? I want to send one. or I am on IM now for a bit. so we can tentative plan? won’t keep you long, I’m running all over today myself. I didn’t get get your dm’s hun? sam just sent me one and it came through…are you tweeting to the right person ;D! my pleasure stacie, valid point about the sharpener ;D! I think I understand what you mean…you want something that is a sheerer pink that enhances your natural color rather than taking it over and being in-you-face type of pink…is that what you mean? If it is, you want to pick things that, when applied, apply sheerly..the more pigmented the product is the more the color it will show. Something sheer will blend in more. Sometimes things look bright in the tube or pot but apply sheerly which is why swatches are awesome and why seeing things in person always helps. These are definitely sheer…anything labeled “lip tint” or “tinted balm” or “sheer gloss” will probably be more what you’re looking for than a fully pigmented lipstick or gloss. Anyhow, if I got that right I bet Muse could recommend some good sheer lippies and I could as well, just ask me 😀 Also, if you already know all this and I was totally off than I’m sorry. LorraineER– freakin’ awesome response! I wanted you to know that I think it is so nice of you to take the time to reply with a helpful answer!! Hey thank you! That makes me feel good. I know you have trouble with them so wanted to make sure 1st. I like that they swivel up and that you don’t need to sharpen them. I have a similar product from Hard Candy that is great but I have to sharpen the heck out of it every single time I use it and it’s a pain. It’s nice just to swivel it up without carrying around a sharpener. Not only that but less messy too. I’m thinking I may get Super Strawberry or Whoppin’ Watermelon. I DM’d awhile ago , you get ? I see you checked out of twitter. I was really surprised how ‘glossy’ these made my lips feel and look. I was expecting more of a dry, lipstick feel for some reason, but as you mentioned, these feel really moisturizing. Definitely going to purchase more in the future! I wanted to get them too!!! It’s an affordable clinique product!! Plus I am an avid lip balm user in need of some colour. Haha. Thanks for the review! The colors look great on you. Now I must buy them all! I am in -love- with these ever since I saw your previous article announcing the press release pictures of these things..
Mega Melon… you will be mine! jen that’s the best shade ever ;D! I got one of these today in Graped Up – they didn’t have my first choice of Super Strawberry or my second choice of Whole Lotta Honey. I really like it so far, nice and moisturizing and lovely subtle color. They smell a bit strange, but then again I have a super sensitive sniffer. As a lip balm fiend, I would definitely recommend these as well. They are selling out super fast though the lady told me me (I got the last Graped Up) and she didn’t see any more on order in the near future. they smell like donuts to me tigress LOL! am I nuts?! So I finally got mine and I gotta say I was wrong. Super Strawberry isn’t my favorite… It’s actually the one I like the least lol. Whoppin’ Watermelon is so pretty but my favorite has got to be Mega Melon!! It gives such a pretty color on my lips 🙂 Tho I do have to sheer it out a little bit. cj I can’t agree more, mega melon=AWESOME! Tarte has something similar I’m about to reveal but the shade has more of a coral pop LOVE! these shades for Spring are a must! cj nooo but the new lusters are amazing seriously but no they don’t actually stain lol! yay kelly ;-D what’s the GWP girl!? Share it ;-D!!!!!!!!!! FINALLY got one (Graped-Up), and I LOVE IT!!!! Thanks so much for the recommendation– once again, you picked a winner! Do you have a recommendation, based on the Chubby Stick colors? I’d really appreciate it! Thank you so much for all of your reviews!